Please check with the newly-weds-to-be what arrangements have been made. 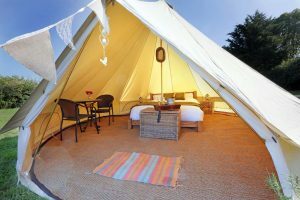 If the wedding you are attending has booked our campsite, there are five furnished luxury bell tents available (please contact the happy couple for details). You are also able to bring your own tents, caravans and camper vans. Please do note the campsite is laid to grass and there are no electric hook up facilities. Staying overnight is only permitted on the night of the wedding. The toilet facilities are a short walk away so we recommend sensible footwear and a torch. There are no permanent shower facilities on site. If you do not wish to camp, please see our list of local accommodation providers. The Barn is all at ground level and is accessed by a gradual slope so is ideal for wheelchair users. The luxury toilets we hire for each wedding are accessed via steps so are unfortunately not suitable for wheelchair users. We can hire disabled-access toilet(s) when required. Please check with the couple what arrangements have been made. Our main car park is grass but there is some hardstanding available for less-mobile guests. Please let us know if you have any special requirements. The venue is on a farm and so we highly recommend sensible shoes. We are a farm and confetti can be fatal to grazing animals, therefore we strictly do not allow synthetic confetti (including the paper variety labelled ‘biodegradable’) anywhere within the grounds. Only natural flower petals are permitted. Our built-in bar offers guests a good selection of cider, lager, beer, wine, spirits and soft drinks at sensible prices. We do have a card machine but, as this is reliant on Wifi, we recommend bringing cash with you too! Please note Cott Farm is a licensed premises. Guests are strictly not permitted to bring their own drinks at any point during the day or night. Any guest bringing their own drink(s) will be asked to leave the premises. The newly-weds-to-be will have (hopefully!) asked you to RSVP with your dietary requirements, and they will pass your reply on to our team. If you have any special dietary requirements and are unsure what arrangements have been made for you, please do get in touch with us. Please do not bring your own food on to the premises. Parking: Our car park is a large field. You are welcome to leave your car overnight at Cott Farm at your own risk. Trains: Our nearest train stations are Crewkerne and Yeovil. Both stations are a short taxi journey from the venue. Buses: The village of East Chinnock is on the A30 between Crewkerne and Yeovil. From Yeovil direction, please ask your bus driver to stop at the lay-by (Broad Lane) just after they leave the village. The venue is approximately 100m from here by foot. Please note, due to our rural location, there aren’t many regular public buses during the daytime and there are no buses at night. Airports: The nearest airports are Bristol (approx. 1 hour) and Bournemouth (approx 1.5 hours). Helicopters: Helicopters may land at the farm by prior arrangement. Please contact us for details. If you are attending a marriage ceremony at Cott Farm, we recommend you arrive at least 30 minutes before the ceremony start time so that you can find your seat first. If you are not staying on site, we highly recommend pre-booking taxi(s) because of our rural location. All entertainment will finish no later than midnight, but please check the wedding finish time on your invitation.